The Excel Investment NPV and IRR Calculation can create and manipulate ready to use cash flow Excel worksheets to analyze business, capital, share, lease purchase cash flow forecasts for internal use, acquisitions and for calculating best valuation for sale. The program calculates Net Present Values, Internal Rates of Return, Accounting Rate of Return, Share Valuation and Economic Valuations over any forecast period to 15, 20, 30 or 50 years. 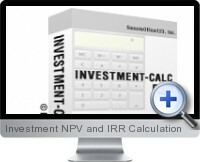 Investment NPV and IRR Calculation for Excel incorporates self generating tables, that calculate yearly asset depreciation values for any yearly capital purchase program, prepares tax calculations, calculates annual lease and loan finance costs and repayments, compounds money values and transfers all values automatically into user's spreadsheets to help save time. The Cash Flow Forecasting template below will help you prepare a 1-15 year cash flow forecast quickly based on annual sales, gross margin, expenses and capital budget forecasts for rapid calculation of Net Present Value, Internal Rate of Return, accounting Rate of Return & Economic Valuation. The Investment NPV and IRR Calculation for Excel can create and manipulate cash flow worksheets to analyze company acquisitions, capital investments, lease purchases, with combinations of term loan/capital lease financing, calculate daily compound deposit interest, optimize capital budgets and value business cash flows. Monthly statistics with refresh for latest NASDAQ, Dow, Oil Prices and US Government Bond rates. Set Excel to auto refresh each time you open Excel for very latest data.